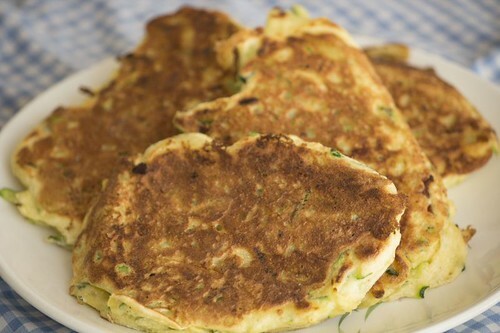 When you are growing zucchini you need to find different ways to use them in the kitchen. This recipe is based on the Edmonds Vegetable Fritter. I've use fresh coriander from the garden for this. 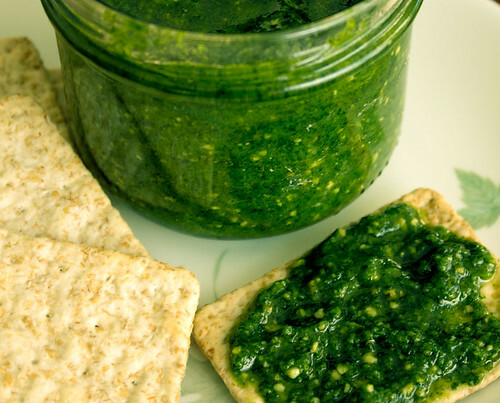 As can be seen from my Rocket Pesto recipe, these pestos are very similar in recipe. I omitted the garlic from this by mistake and found it was really tasty despite doing so. Blend coriander, garlic, cashew nuts and parmesan in a food processor until everything is finely chopped. While the food processor is running, gradually add the oil in a thin steady stream util well combined. Transfer to an airtight jar and cover with a little extra oil to prevent it oxidising and discolouring. This makes about a cup of pesto. 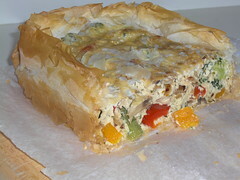 Lightly mix in the courgettes, onion, cheese, flour, baking powder, oil, and seasoning (i.e. everything else except the tomatoes). Lightly grease a shallow baking dish. Pour half the mixture into the disk. Add a layer of tomatoes, cover with rest of mixture and decorate top with tomato. Bake 180 degrees for 35 to 40 minutes or until golden brown and firm to touch. Serve warm. Nice with relish. This recipe is useful for using leftover vegetables. All quantities are approximate. Heat oil in pan. Lightly cook onions and garlic. Allow to cool. Lightly cook other vegetables (either steamed, microwaved, or with onions). Mix eggs and ricotta until smooth. Add vegetables and combine. Prepare baking paper to line pie dish. Lay a sheet of filo on baking paper. Spray with oil spray (or use melted butter). Repeat until you have 6 sheets laid out. Place baking paper and filo into pie dish. Don't worry about crumpling the corners, this adds the the charm of filo. Pour mixture into pie dish. Spread to the corners. Spray/butter remaining 2 filo sheets. Cover pie, crumpling corners. Rest for 10 minutes before serving. Enjoy.